In my first post, I provided a little background to the development of this paradigm I’ve created, called gospel-centered spiritual formation. I argued that the literature on spiritual disciplines largely does not factor in the gospel, and gospel-centered literature has yet to address the role of spiritual disciplines in the life of a gospel-centered Christian. This dichotomy is an unfortunate one, and I think it can be addressed, which I intend to do through a triperspectival framework. Although I have written several articles on triperspectivalism, I don’t want to assume everyone knows what I’m talking about. The two pioneering theologians on triperpsectivalism (or multiperspectivalism) are John Frame and Vern Poythress. Generally speaking, triperspectivalism focuses on the three offices of Christ’s mediation, namely prophet, priest, and king. In his book Symphonic Theology, Poythress says “each of the three main offices can be expanded into a perspective on the way in which Christ mediates the presence of God to human beings” (39). Ultimately, prophet, priest, and king–the three roles of Old Testament leadership–culminate in the person and work of Christ. From an epistemological standpoint, John Frame argues that we have true knowledge from three perspectives–normative (pertaining to God’s law), situational (pertaining to the world), and existential (pertaining to oneself). In his book, The Doctrine of the Knowledge of God, Frame says each facet of knowledge are interdependent, ultimately identical, and “perspectively” related, viewing the same knowledge from different “angles” (89). Later Frame argues that no one perspective is ultimate; rather, they are equally important and equally ultimate so that without the others, one perspective could not be intelligible (163). Prophet corresponds with Normative knowledge (God’s Word). The faculty is the head, and the venue is the text of God’s authoritative (normalizing) Word. Priest corresponds with Existential knowledge (oneself). The faculty is the heart, and the venue is the subtext of one’s life and (subjective) experience of knowledge/truth. King corresponds with Situational knowledge (world). The faculty is the hands, and the venue is the context of the world and how knowledge, rightly applied, brings change under the reign of the King. The Christian life is a multi-faceted jewel properly appraised when seen through different angles or perspectives. I believe this is especially true when it comes to understanding the gospel and discipleship. We need to see Christ’s work and our union with Him through all of His mediatorial offices of prophet, priest, and king. We need to see the Christian life and discipleship holistically so that it accounts for our head (doctrine), heart (affection), and hands (living). A maturing Christian properly balanced will submit to the normalizing text of God’s Word, experience the affective nature of the gospel in his heart (subtext), and regularly reorient his life through the implications and application of the gospel (context). What I discover in the triperspectivalism is the most comprehensive approach to viewing the gospel, discipleship, and spiritual disciplines within one framework. In Christ’s prophetic office, I discovered a “form” of the gospel that emphasizes the message of the gospel. I also discovered a subset of spiritual disciplines directed to the “normative” work of the text of God’s Word. In Christ’s priestly office, I discovered a “form” of the gospel that emphasizes the story of the gospel, and in particular how that story rewrites the story of our lives experientially. I also discovered a subset of spiritual disciplines directed to the “existential” work of God’s Word in the subtext of our heart. In Christ’s kingly office, I discovered a “form” of the gospel that emphasizes the gospel of the kingdom, and how in particular a person’s life is brought under the reign and rule of Christ as the gospel is applied in every area of one’s life. I also discovered a subset of spiritual disciplines directed to the “situational” work of God’s Word in the context of the world around them. Do you see where I’m going? If this confuses you, I’m going to break down each perspective and show how I came to these observations and conclusions. For now, I simply want to state them together and leave it for your consideration. To help draw the distinction in categories, think of the gospel in “forms“, formation through perspectives, and disciplines as the outworking of the implications of our union with Christ. We need Christians who are radically gospel-centered, continually rediscovering all that God is for us in our Prophet, Priest, and King. We need the head, heart, and hands of disciples formed by the gospel. 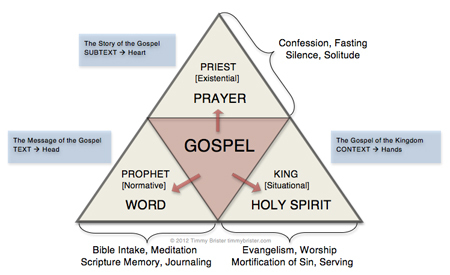 We gospel-centered disciples who are disciplined in all spheres of text, subtext, and context. The way I made these necessary elements of the Christian life make sense (at least to me!) in one framework is through the following diagram. Give it another look, as I plan to break it down in greater detail in blogposts to come.